Please note, this "book" has been translated into English from its Russian form. Any small grammatical flaws that occur are simply the result of this translation. Information from the previous chapters answers the question: Why do humates stimulate growth and plant development? In this chapter I shall try to answer the question: How does this happen? On one level, experience of Humates usage has a 50-year history and during that time a huge amount of practical material has been accumulated, but on another level, the new technology relative to the Irkutsk Humates production, characterizes a new stage of development. Today we have evidence that this new technology allows us to not only decrease production costs, but to produce a new high quality product. Firstly, let us consider the 50-year experience of Humate usage, based on brown coal and peat, then consider and analyze content and quality of Irkutsk humates and the results of their usage. The treatment of seeds is particularly important for potatoes. Soaking the potato tubers in the humate solution prior to planting is practically the only necessary operation in treatment of potatoes, especially since spraying the vegetating potato plants can lead to growth of the over-ground parts of the plant at the expense of the tubers’ development. As you will observe in the following photograph, the treatment of the tubers prior to planting results in an increase of quantity and vigor of the shoots. Fig. 5. 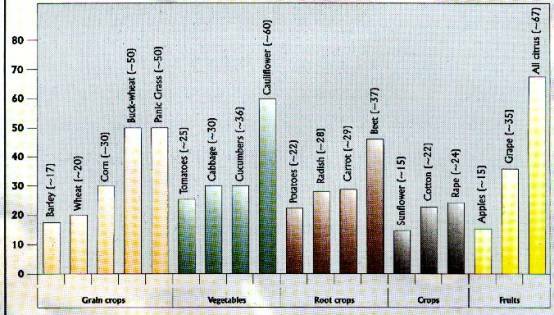 Humates and the increase in crop capacity in agriculture. It is important to note that the tests (particularly the ones on vegetables planted in both open and closed conditions) were carried out on a wide scale, which ensured accuracy of the results. For instance, the tests of the oxy-humate preparation were simultaneously carried out at twenty greenhouse farms in Ukraine and Byelorussia. 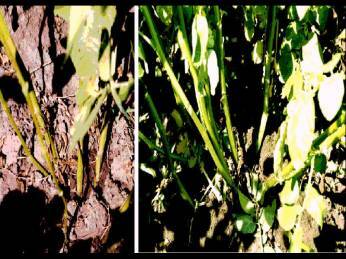 The test technologies included soaking of the seeds prior to planting in water-based humate solution, as well as two-time watering of the vegetating plants and prophylactic spraying with the humates against disease. Complex tests of non-ballast humates educed from brown coal of the Kansk-Achinsk and Dnepropetrovsk coal fields, as well as coal fields near Moscow, were carried out. Tests on vegetables, wheat, cotton, and other cultures were carried out in dozens of hectares of open fields in different regions of the country. Average humate consumption amounted to 5-10 kg/hectare or 400 liters of 0.005% solution per treatment. When the first industrial production of ballast humates was established during the 1960s in Ukraine, at the Semenovsky mineral wax works, up to 60 tons per year were used for agricultural needs. 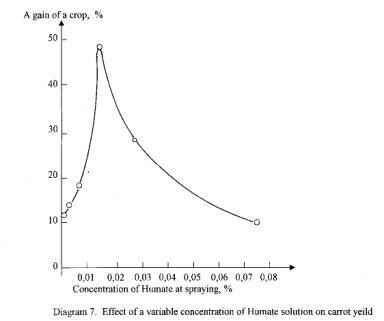 Thus, with this extensive research it was established that humates are conducive to a direct increase in the yield capacity of most agricultural crops. Important data in humate use in floriculture was also published. The root and non-root treatment of arboreal plants (such as Crimean pine), shrubs (three types of roses), and lianas by the ammonium humate was tested at the Donetsk botanical gardens. (Science Academy of Ukraine.) The increase in growth of these plants, particularly of roses and lianas, by the end of vegetation reached 1.3-2 times, compared with the control group. In 1990-1992, humates were used for treatment of roses, tulips, hydrangea cuttings, and socotra, as well as for singling of plants. In all cases, the flowering accelerated by 5-10 days, while the amount and size of the buds and their stamina improved. Other research proved the effectiveness of humate use in ornamental gardening. Irkutsk Humates the mentioned data was published in the 1960s-1980s, and it generalized the experience of using the humates educed according to the old extracting technology. These humates were educed from Belo Russian peat and brown coal from Ukraine, the Kansk-Achinsk coal fields, as well as coal fields near Moscow. As it was mentioned earlier, these products were not cost-efficient, and their use in the republics of the USSR was confined to individual, though wide scale, tests. With the creation of the Irkutsk high-concentrate humates, substantial changes took place, both quantitative and qualitative. It was proven by new research and by field tests carried out in the Irkutsk region during the last three years. Table 1. Characteristics of the commercial samples of humates.